Finest Expressions: New Holiday Candy Bouquets Have Arrived! New Holiday Candy Bouquets Have Arrived! 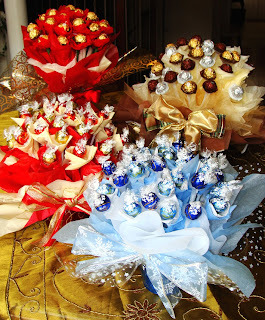 Our new sensational candy bouquet designs, especially for the holiday season have now arrived! They are made with indulgent Lindt Lindor and Ferrero choclates. They come in charming holiday themed ceramic pots. Make your holiday party even more spectacular by adding our delectable chocolate bouquets as centrepieces! You can also incorporate your party theme or corporate colours to any of our bouquets. Don't find what you are looking for? No worries, we will design a candy bouquet using your theme and budget! *Some restrictions may apply. 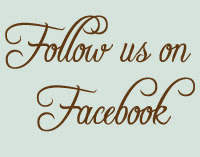 Email us at info@finestexpressions.com or call us at 416.904.8658 for further details. told me that every candy should come with a brush. So maybe, now that I'm older, I'll include a brush and toothpaste to my candy bouquet. Holiday Candy & Chocolate Bouquets - Coming Soon! 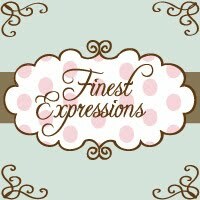 Finest Expressions - Designer Gifts & Gift Baskets offers unique baby gifts, wedding and party favours. We have a wide selection of adorable baby gifts and exquisite wedding/party favours for you to choose from. Most of our products are hand-crafted in-house, such as our baby diaper cakes, candy trees and baby clothing/sock bouquets. Find information on how to plan fabulous baby showers, throw unforgettable wedding receptions, buy unique baby gifts and so much more!